Jesse Paggen is lead custodian in the Sartell schools. 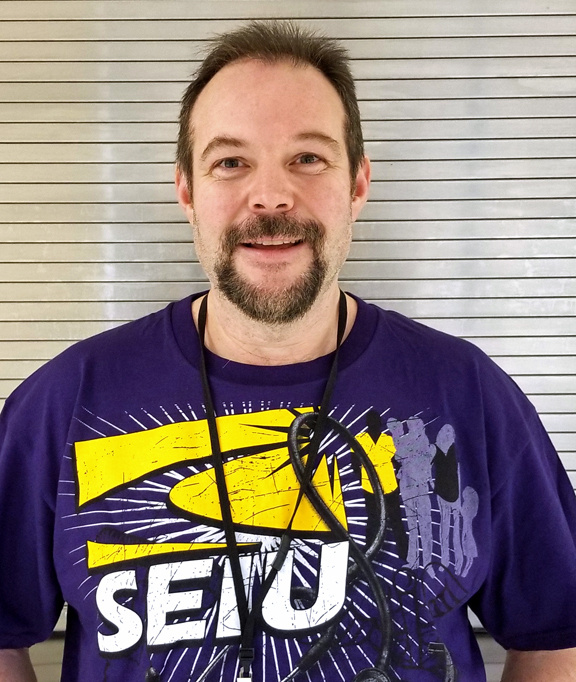 As a union member with SEIU Local 284 in the Sartell schools, being in a union means having a voice to be heard as a group – even a family – so we can get what we so rightfully deserve. We all just want a piece of the American dream: a well-paying job with benefits for our families. We work hard and deserve to get the best pay and benefits possible. With our union, we can stick together to not let big business run over the little guys like us. I’m the lead custodian in the Sartell schools, where I’ve been for 22 years, and I am a proud union steward in Local 284. We all live in our community and care deeply about our public schools. My team and I work hard every day to make sure our buildings are safe and clean for our students. We’ve had some issues over the last few years, and we voted to authorize a strike in December 2017 in order to make the district understand that it needed to do better. We reached a fair deal in the end and didn’t have to strike, but by sticking together we were able to get better results for our families and our schools than we ever would have alone. That is the power of being in a union. But now, because of that power, a well-organized group of billionaires and corporate special interests have a case before the U.S. Supreme Court called Janus v. AFSCME, and it could undermine our unions. Basically, these special interests want to make every public sector union into “right to work,” which we all know really is just a fancy way of saying they are trying to destroy our ability to come together and make gains for our families. The nine Supreme Court justices heard oral arguments in Janus on Feb. 26, and they will rule sometime this spring. Most people assume they will rule for the anti-union plaintiff. In anticipation, many unions have been making sure working people understand what it means to be a union member – and what we can accomplish together. My union, which brings together over 9,000 school employees across the state, has been working hard to make certain we don’t let any divide-and-conquer techniques rip us apart. We can, and must, come out stronger from this attack. The groups attacking us think that making it harder for unions to survive will mean that we won’t be strong enough to fight for the things we deserve. They think they can divide us so we won’t have a unified voice, something everyone knows working people need to win a better future for our families. I think they are wrong. I think no matter what this court case says, our unions are stronger than the divide-and-conquer techniques our opponents are using. More and more people are realizing that our system is rigged in favor of those at the top. They want regular families to be able to make ends meet and have a chance to get ahead. In the richest country in the history of the world, this doesn’t seem like too much to ask. When we stick together with our unions (and work to get more people the chance to join unions), we can tip the scales back towards working families. If we let them split us apart, I’m scared to see where things will go. As the Janus case rolls along, let’s prove our opponents wrong and use this moment to build a strong labor movement that sticks together and wins a better future for working families across Minnesota. – Jesse Paggen is a member of SEIU Local 284 and lead custodian in Independent School District 748.